One of the ways to speed up an SBS reboot is to shutdown certain key services before clicking the Restart button on updates or when needing to manually reboot the server. By downing the Exchange services, SMTP, and IIS beforehand, one will see a marked decrease in the amount of time the SBS box will take to reboot. Note that the first service for the POP3Connector does not need to be there if the feature is not being used. This applies for both versions of the batch file. The order for shutting down the services is particularly important. Shut down a service that has a dependency first, and an error will be generated for each of the service's dependents. Note the absence of the last command to shutdown the IIS (W3SVC ) service! It may not be a good idea to combine the scheduled reboot batch file (previous blog post) and these batch file commands just in case one of the services hangs while stopping. Best schedule this batch file about 5 minutes before the reboot batch file depending on the speed of the SBS box. Give more time between the two batch files the older the SBS box is. If something hangs in the first batch file, the -f Force option in the subsequent shutdown command will take care of it. Note that the commands in the batch file are not case sensitive. 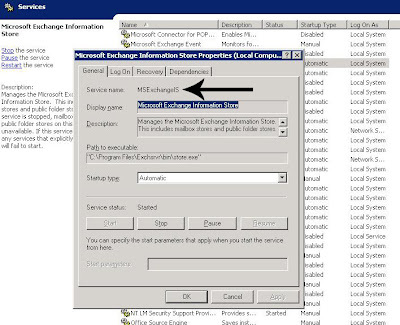 To start the services from the command line is just as simple: net start msexchangeis [Enter]. UPDATE 2008-02-15: Changed the name of the suggested batch files to better reflect what the batch will do. P.